We all received shocking news a few days back that Google will be shutting down Google Reader in a few months. 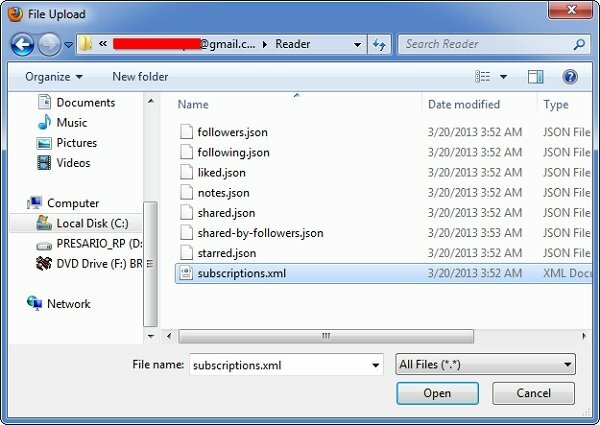 If you are a Google reader user, you should create a backup of all your subscriptions and RSS feeds so that you can use it on any other service if you wish to. 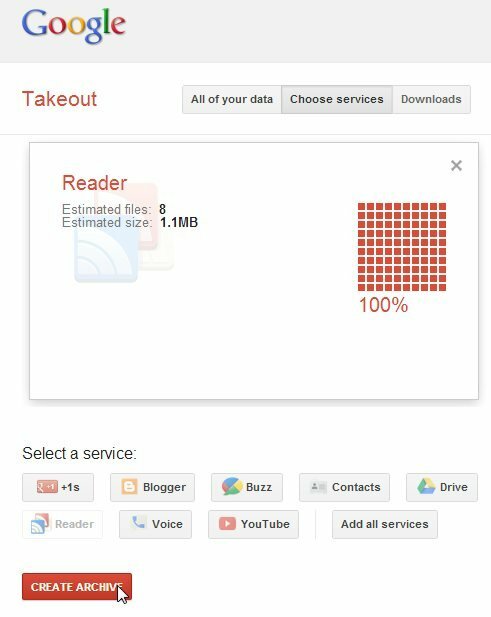 If you are looking for a simple way to export Google Reader data and feeds, give Google Takeout a try. Let’s take a look at how you can export Google Reader feeds and data using Google Takeout. Head over to the Google Takeout homepage and login with your credentials. 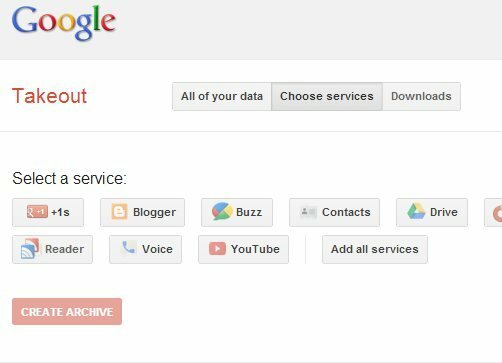 After logging in, you will be redirected to the Google Takeout dashboard where it will show you all the Google services. First we want to make a backup of our Google Reader subscriptions, so go to the “Choose Services” tab and select Google Reader. After you click on Google Reader, it will show you the estimated number of files in Google Reader along with the size of the backup file. Just click on the “Create Archive” button. 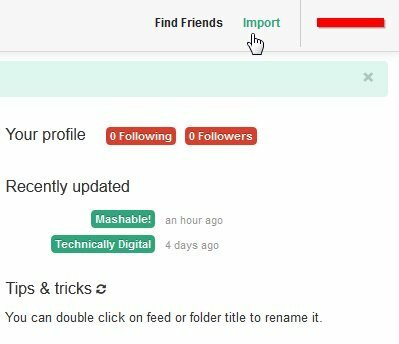 It will start to create your backup file and that may take some time depending on the number of feeds you have in Google Reader. After the backup file is created, click on the “Download” button. Earlier this week, we shared with our users some great alternatives to Google Reader. You can select any service from the list but we will be looking at The Old Reader and Netvibes, as they are simple and easy to use. Personally, I prefer The Old Reader over other RSS Readers, as it has a simple interface and looks more like Google Reader. Before we proceed, extract the zipped Google Reader backup file. Visit The Old Reader homepage and login with your Facebook or Google ID. After logging in, click on the “Import” button in the top right corner of the screen. Browse the file name “Subscriptions.xml” from the folder we extracted earlier and click on “Import”. 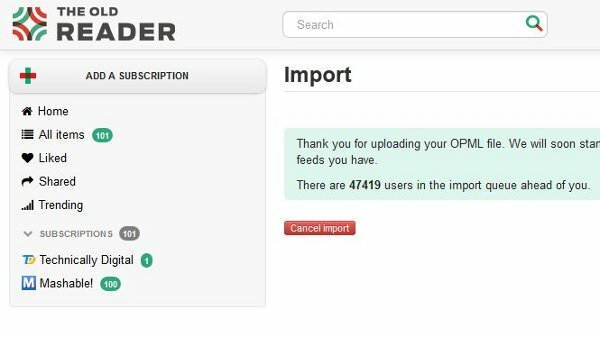 The import process will start and might take some time depending on the number of feeds you have as well as the number of users in queue. After the news of Google Reader shutting down, many people switched from Google Reader to The Old Reader, so it might take some time to import your feeds. Many people are shocked to hear the news about Google Reader closing down, but I don’t think there is anything to worry about. There are so many good alternatives available. If you prefer RSS feeds over social networks, just check out some of the Google Reader alternatives we mentioned and use the info here to export Google Reader feeds and data. If you already imported your Google Reader feeds and data, please share with us which reader you switched to in the comments section below. I went to newsblur some time ago and it’s excellent but got hammered after the announcement so I tried Feedly. Feedly on Android is brilliant on a pc not so much. I went to gMail itself. Using http://blogtrottr.com/, it imports the gReader exported file and then Email each post. Now I’m in the process of setting up filters and tags in order to weed out posts that I have no interest in. Can’t think of a better alternative.